When was Cheese invented? Historians tend to agree that Cheese was invented in c. 7,500 BCE in Poland, a region that was dominated by the Iron and Bronze Age Lusatian culture of the Silesians. Archaeological evidence, and the use of special chemical analysis, have found milk fats in pottery vessels that were used to process dairy products. These fragments of ancient pottery from Kujawy, Poland were pierced with small holes that looked like modern cheese-strainers. The Ancient Sumerians of Mesopotamia are also known to have made cow's milk into cheeses and butters c.3000 B.C.E. and stone carvings of Ancient Egyptians testify that this culture milked cows and made cheese c.3100 B.C.E. Definition of Cheese: Cheese is defined as a solid food prepared from the pressed curd of milk coagulated usually with rennet, separated from the whey, and pressed into a solid mass in a mold. Fact 1: Who invented cheese? The name of the inventor of Cheese is unknown but it is believed to have been invented in c. 7,500 BCE in Poland, Central Europe, during the Neolithic Period (10,200 - 3000 BC) era of inventions. Fact 2: Who invented cheese? Prior to the invention, c. 7,500 BCE, farms were slowly being established and livestock such as cows and goats were being kept. Fact 3: Who invented cheese? Goats were most likely the first dairy animals ever domesticated. Aurochs, which were the wild ancestors of domesticated cows, that ranged over large areas of Europe, Asia and North Africa followed. Goats and cattle became a prime source of food in many ancient settlements. Fact 4: Who invented cheese? The milking of cows followed the domestication of cattle and evidence has been found that the Lusatian, Mesopotamian and Ancient Egyptian farms, villages and fortified settlements all developed was of processing dairy products. The Ancient Chinese are one of the very few ancient societies that, due to a lack of suitable grazing, did not develop some sort of reliance on milk. Fact 5: Who invented cheese? Animals gave milk but it would quickly sour, especially in warm or hot weather. Milk was not a product that could be stored for a long period of time. Fact 6: Who invented cheese? The invention was probably accidental. In ancient times liquids, such as water or milk, were transported in sheep or cow stomachs. It is probable that someone placed a ration of milk into such as carrier made from a cow's stomach to take it on a short journey and accidentally discovered cheese. Fact 7: Who invented cheese? The inner membrane of the cow's stomach produced rennet, a substance containing the enzyme rennin which has the property of clotting, or curdling, milk. The rennet and the hot sun would have caused his milk to separate into the thin, watery part of milk called whey and lumpy curds of cheese. Fact 8: Who invented cheese? Not wanting to waste his ration of milk, he would have drunk the whey, which he would have found quite refreshing, and ate the curds that he would have found very tasty. Fact 9: Who invented cheese? 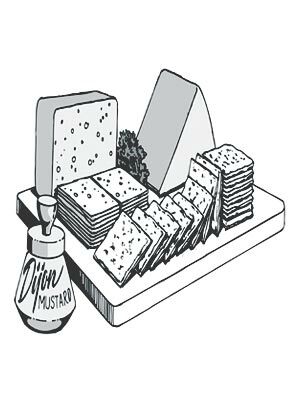 Once people had discovered cheese they found that it allowed the preservation of milk in a non-perishable form, was easily transportable and digestible. Cheese soon became a valuable commodity for early, prehistoric farmers. Fact 10: Who invented cheese? Various ancient civilizations developed early cheese making techniques. Perforated vessels, that probably served as sieves, were used for separating curds from whey and cheese. Cheeses were stored in pottery bowls that were sealed in clay for preservation purposes. Fact 11: Who invented cheese? By the time of the Roman Empire, cheese-making had become a widespread, highly valued process and mass produced throughout Europe and the Middle East. Fact 12: Who invented cheese? Cheese-makers knew how to press, ripen, and cure fresh cheeses to ensure their preservation for long periods. Fact 13: Who invented cheese? Each country developed different types of cheese that reflected local ingredients and conditions. Herbs, spices, dried fruits or mushrooms were added to the curds, or infused in the milk, to provide unusual and distinctive tastes. Some even developed a technique to produce vegetable rennet from fig leaves, wild artichokes, safflower, or even melon. Fact 14: Who invented cheese? Two main types of cheeses emerged: soft cheeses and hard cheeses. Soft cheeses, intended for immediate consumption, included Brie, Camembert, Ricotta and cottage. Hard cheeses included Cheddar, Edam, Gouda, Gruyère, Emmental. Fact 15: Who invented cheese? Roquefort blue cheese, infested with a mold called penicillium roqueforti, dates back to the 7th century. Stilton and Gorgonzola also owe their blue veins or marbling to molds. Fact 16: Who invented cheese? Famous names of cheeses include Gorgonzola Cheese, that was made for the first time in 879 AD in the Pro Valley, Italy. The first Cheddar cheese was made c1180 in England. Emmental Cheese was first made in Switzerland during the early 1300's. Fact 17: Who invented cheese? Cheese has been produced in America since early in the 17th century when English Puritans brought their knowledge of cheesemaking to the English colonies of the New World. Fact 18: Who invented cheese? In 1851, Jesse Williams of Rome, Georgia in the United States opened the first the cheese factory and introduced the large-scale production of cheeses, producing 100,000 pounds of cheese in its first year. Fact 20: Who invented cheese? In modern times cheese remains one of the principal agricultural products of the world. Fast Info and Fact File: Who invented cheese? Country of Origin: Poland *** Name of Inventor: Unknown *** Nationality of Inventor: Polish *** Date of Invention: c. 7,500 BCE *** Invention Era: Neolithic Period (10,200 - 3000 BC). Who Invented Cheese? - Poland, Mesopotamia, Ancient Egypt - History - Timeline - Unknown Inventor - Invention - Definition - Meaning - Famous - Innovation - Significant - Development - Food and Drink - First - Definition - Kids - Facts - Information - Info - Cheeses - Dates - When - Why - Impact - Purpose - Use - New - Old - Definition - Meaning - Awesome - Cool - Neolithic Period (10,200 - 3000 BC) - Poland - History - Timeline - Who invented Cheese?